We are happy to announce a new feature to RealTimeRental has been released, Reporting Widgets. Reporting Widgets allow you to customize your homepage in RealTimeRental. The widgets will show you information about your rentals at a glance. Read some descriptions of available reporting widgets below. 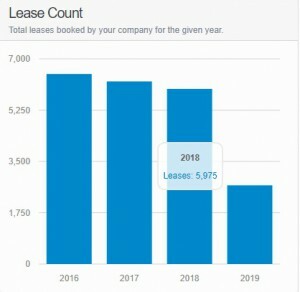 This bar graph shows you at a glance how many bookings were created for the current year compared to the two previous years, and how many bookings have been created so far for next year. This chart shows the most common states that your rental guests come from at a glance. This can be a useful tool for marketing. 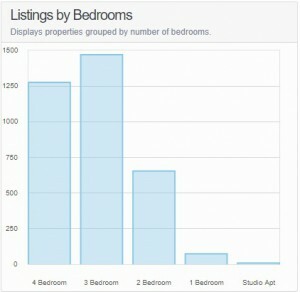 This chart displays the number of active properties in your rental inventory sorted by number of bedrooms. 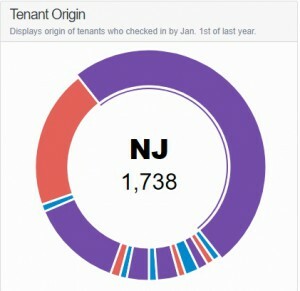 View at a glance how many of each type of rental property you represent. To view all available widgets, Log into your RealTimeRental account. From the main menu, click the TOOLS tab, then click WIDGET MANAGEMENT. This screen will allow you to activate the widgets for your individual login or for all users in your office. For users to activate the reporting widgets, you must have manager level access and above.